But Southrepps, two miles from the North Norfolk coast, has its very English charms (and the, in my view, very substantial bonus of being a Lib Dem/Remain pocket in a sea of Brexiters). This particular lane is my favourite of many routes that can be taken between the village and the sea, and we caught it on a specially beautiful late afternoon/early evening. But I pre-empt, since the purpose is to hymn the praises of the archetypal small-festival success story, as I did last year on the Other Site, which alas rather discourages such coverage for reasons I won't broadcast here; needless to say I profoundly disagree with them. It's worth drawing attention to a more wide-ranging piece which should have gone there but owing to last autumn's kerfuffle ended up on the blog, a set of articles on how to go about and promote small festivals like this, curated by Sophia Rahman - I got to know her, along with Jonathan, at last summer's Pärnu Festival, a big 'un in a relatively miniature gem of a setting. bus, plane, tube, foot and two trains. 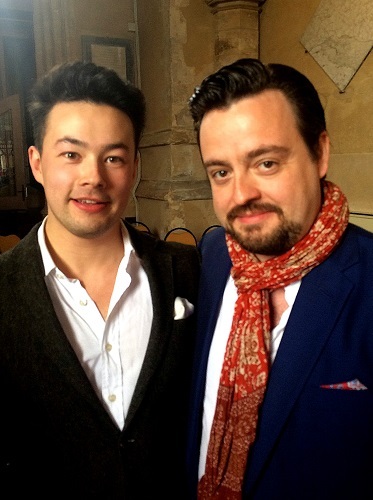 If this Saturday night wasn't quite the unalloyed pleasure that last year's strings-and-piano spectacular certainly was, that had to do with the tricky business of getting a chorus of opera singers who'd participated in Ben's masterclasses to blend. Which, let's be honest, they did not in Handel's Dixit Dominus. What we did get was the shock of the new in the 22-year-old composer's central sequence and some impressive runs from Mrs Johnson, the excellent Susanna Hurrell. More consistently fine things followed in conductor Johnson's beautifully programmed second half. The choral blend was so much better in Bruckner's Locus iste - for which I have a special fondness, having sung it at the wedding of another Mr and Mrs Johnson, Stephen and Kate, in another beautiful place, Colwall, Herefordshire - and Stanford's Beati quorum via (a favourite of my All Saints Banstead youth). The strings did a fine job on one rarity I'd never heard before, Vaughan Williams' arrangement (with Arnold Foster) of Bach's so-called 'Giant' Fugue and on another I heard for the first time at last year's festival, Harold Darke's VW-worthy Meditation on 'Brother James's Air'; this time we heard the original before it, perfectly intoned by the three sopranos. The official finale was a gift to the 16 singers on the week-long course, Vaughan-Williams' Serenade to Music arranged (very successfully) for strings and piano. There were some outstanding lines here, but the thing was the work itself, which always leaves me wishing it would float on for 10 more minutes. Brahms's earliest accompanied choral song, the Geistliches Lied, made a touching envoi. Last year's Sunday morning chamber concert was one I'll never forget - a performance of Schubert's String Quintet which made me hope I wouldn't have to hear that profound masterpiece live again for another five years (I have, twice, in the intervening year, but the next one forced me to flee, pleading unwellness, after the first movement, and last Friday's Rosendal performance was rendered fascinating only by what the utterly compelling, but not show-offy, Sol Gabetta made of the second cello part). This year's double whammy offered different revelations. It began with my first live hearing of Vaughan Williams' Five Mystical Songs, sung with dedication by baritone Jonathan McGovern backed up by soulful string quartet and festival co-host Tom Primrose (who for some reason seems to be missing from the above photo, where McGovern is flanked by Rowan Bell, Jessica Wadely, Elitsa Bogdanova and Jonathan Bloxham). I'd been unlucky enough to miss solo recitals by poet of the guitar Sean Shibe (pictured above with Ben, who also supplied this picture), whose Britten Nocturnal had held a Wigmore audience spellbound last year, and by BBC Young Musician of the Year 2014 Martin James Bartlett. Yet Bartlett was bound to shine in the extraordinarily difficult piano part of Mendelssohn's D minor Trio, and he did, to breathtaking effect. Violinist and cellist play second fiddles, as it were, to the pianist, as Mendelssohn dictates, in the exquisite 'song without words' of the second movement and the fairy-music scintillation of yet another one of his unique scherzos, but Agata and Jonathan duetted perfectly, the ideal chamber musicians. If they'd made a recording and sold it on the door, I'd have bought it, no doubt. What a revelation this year has been for me so far in terms of Mendelssohn's chamber music, even if I had to make do with three out of the six string quartets in the Calidores' stunning East Neuk cycle. Here's a shot Ben J sent me of McGovern with the trio - and yes, MJB is of an age to be allowed a drink. After that we shared a fine lunch with Jonathan in the garden of the Vernon Arms - first-class fish and chips, friendly service, and a wonderful hub for the musicians - and I chatted to a few other folk, including MJB and his mum. It was clearly such a good thing for the enchanting young fellow to be among friendly musicians performing chamber music; the concert soloist's life could be a lonely one if the balance isn't right. He said - and clearly he's sincere- he wanted to come back next year. Brahms or Schumann for chamber elevenses, perhaps? and a collared dove perched irresistibly on a dead branch. before arriving at St James at around 7pm. in the company of the lighting designer and a delightful local man who'd been bellringing for decades. First half was, by tradition, operatic excerpts and songs with Primrose as sprightly accompanist. Ben sang Massenet, Susanna Rosalinde's Czardas; they excelled in the Figaro Act 1 Trio - BJ has such a gift for comedy - and in the Watch Duet from Fledermaus. No wonder it was so vivid and funny; they've just finished a run in the Opera Holland Park production. Now wishing I hadn't missed it; I laughed out loud at the gags and the translation, which hasn't happened in any Fledermaus staging I've seen (though I love my Boskovsky recording). Of the rest, mezzo Claire Barnett-Jones may well become a dramatic mezzo of stature, though Humperdinck's Witch didn't show off the full lustre. The other voice which sounded like a superb instrument - though all sang musically and had clearly been well coached - was that of baritone Henry Neill, a precociously convincing Figaro Count. And then the apotheosis, kept as a surprise, though the two pianos and the music stands might have given it away: the original version of Saint-Saëns' Carnival of the Animals, which I'm not sure I ever heard in a concert hall before. Master of Ceremonies was the third of the Southrepps triumvirate, Daniel Goode, a born Savoyard, a silent Cherubino (!) in the aforementioned Figaro trio, an English Tom Lehrer for 'Poisoning Pigeons in the Park' and now a very funny narrator, mixing a low quotient of Ogden Nash's verses with his own. 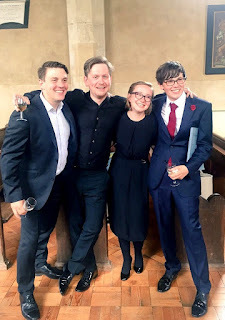 But of course the laughs are there in the music, too, especially from Primrose and Bartlett as zoo-specimen 'Pianists' - they were both consummate elsewhere, Primrose matching MJB for virtuosity in the Presto furioso of 'Wild Asses' - and from Agata as one of the 'Personages with Long Ears'. It beats me why Saint-Saëns should have ever suppressed the score in his lifetime, fearing it might overshadow his more 'serious' work: there's mysterious poetry in 'Aquarium' and 'Cuckoo in the Wood' - yes, they imported a clarinettist as well as a flautist, though a glock had to make do as usual for the fishy glass harmonica - and when done as classically as it was by Bloxham, Bartlett and Primrose, 'The Swan' is exquisite. around Southrepps Commons, beautifully managed by a local trust. Then we walked along the lane to catch the train from Gunton to Norwich - with Jonathan and Jess, as it turned out - and stopped in that splendid town to have lunch with friends Kate and Fairless in their new old-rectory home. Back to Liverpool Street, and an equally interesting walk from there to the Southwark Playhouse for the well-done but predictable disappointing Rodgers and Hammerstein Allegro, an interesting turkey. It's been a bit quieter since those mad five days. I'll leave you with a neat little film put together after last year's festival. I'd love the whole of that Schubert Quintet on film, but you can get a sense of it here. I champion you for championing smaller festivals! I look forward to the new concert season beginning here next month. While it is centered on subscriptions to the Met Opera and Carnegie Hall, I am pleased my own season will start with Lucy Dhegrae's Resonant Bodies Festival. I wonder if you've run across Julia Bullock? She's received a good bit of positive note over here, like this, and, along with two other interesting young singers, Alice Teyssier and Sofia Jurnberg, will open the three-day festival. I'm very much looking forward to that. As to the change in landscapes, no, you are not "nuts" at all--and what I love about your photographs, with the Southrepps a stellar example, is how much you are able to draw out of the charms of every place you visit. Haven't come across Julia Bullock, Sue, only our own dramatic soprano Sue (adorable person, too). I like it that we have our parallel proteges, inasmuch as we support them, even if yours are more cutting-edge. Knew you'd appreciate the subtler charms of a very special part of Norfolk (I think I like the north-eastern corner best - at least since the Burnhams became hyper Chelsea-on-sea). I just discovered that Julia Bullock will be coming your way, 4/25/17, at the Barbican. She'll be singing Kitty Oppenheimer in John Adams's Dr. Atomic, with Gerard Finley as Oppenheimer (Penny Woolcock director). Adams will conduct the BBC Symphony Orchestra. I think I typed "Gerard," but of course it's "Gerald" Finley. Can't wait to hear Dr Atomic again. I got Finley's cover at ENO but was blown away by seeing GF so intense in the Sellars production on DVD.